Want to upgrade your phone to a brand new one for only £1? Today just might be your lucky day - Honor is offering the chance to buy a brand new Honor 8 for only a quid today. 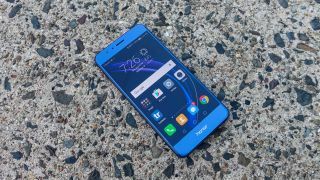 The Honor 8, Honor 7 Premium, Honor 7 and Honor Band Z1 are all up for sale, but you’ll need to be quick on your keyboard to buy it as there's only one of each up for sale every hour according to the Honor website. If you’re the first person to buy one of the devices on the hour you'll get it for £1 - if you're not fast enough you'll be notified before you press buy. You'll need to buy it by 8PM BST today and live in the UK, Germany, Spain, France, Portugal, Italy, Switzerland, Belgium or the Netherlands. The Honor 8 usually costs £369.99 and comes with a 5.2-inch Full HD screen, a powerful Kirin 950 processor, 4GB of RAM, 12MP rear camera and Android 6 Marshmallow software. You can easily buy it alongside the Honor 7 and Honor Band Z1 through Vmall today.